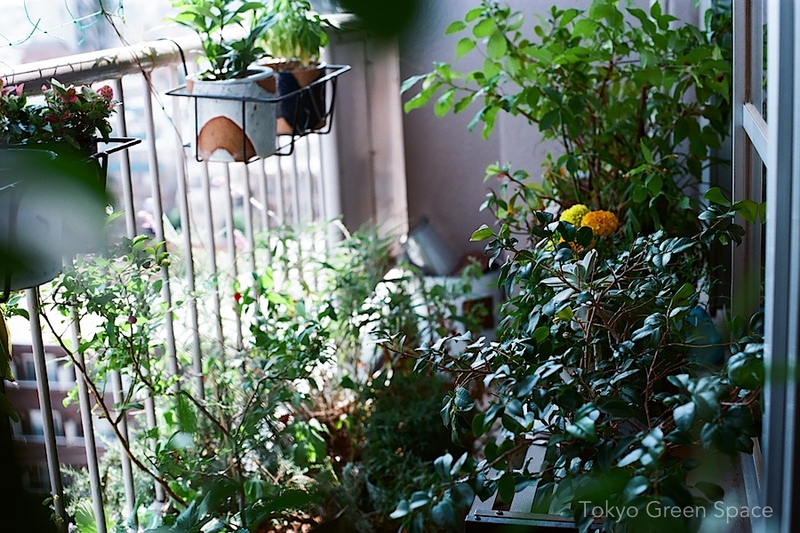 Many times people cannot believe it when I tell them that I have hundreds of plants on my tiny Tokyo balcony. I guess it’s a “more is more” philosophy, combined with a reluctance to reject attractive plants I buy each week. 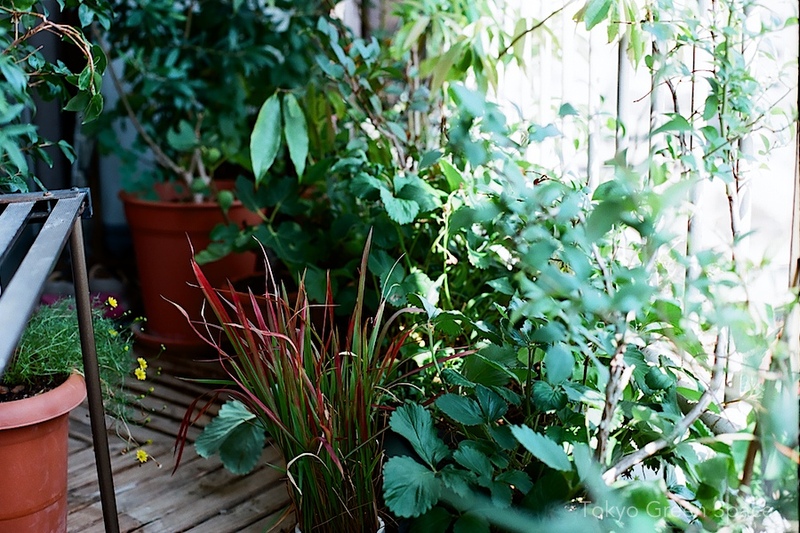 The small size of my balcony garden means that each plant is always juxtaposed with others. In the center is a pink flower from an annual that’s lasted two years already and whose name I’ve forgotten. It’s in a white ceramic pot I made, and next to the basil I’ve been eating all summer. The broad leaf is a bird of paradise houseplant that is spending some time outdoors after becoming an ant magnet. A furin is a glass wind chime whose sound Japanese find cooling in summer; something about glass and metal striking. I was amazed to see this domestic symbol, along with a white chandelier (below), decorating two homes in this long row of wood and blue tarp cubes sheltering the homeless. 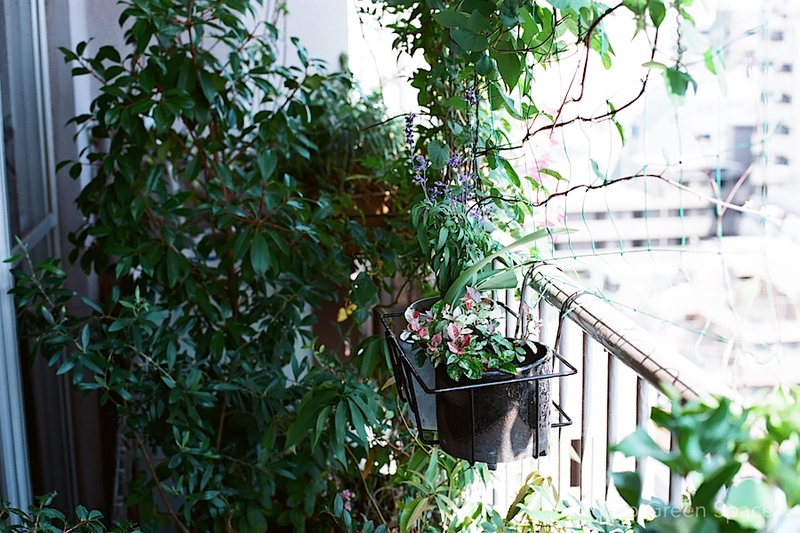 (The furin is just to the right of the rolled up bamboo used to screen door). I am struck by how incredibly orderly these living structures are, and how on a warm day when you gaze inside, the homes seem orderly and common place: tidy kitchens, matt floors, shelves and storage, on a scale just slightly smaller than what most Tokyo-ites live in. This long alley of make-shift homes is just below Miyashita Park that paces the Yamanote line for a fe blocks. 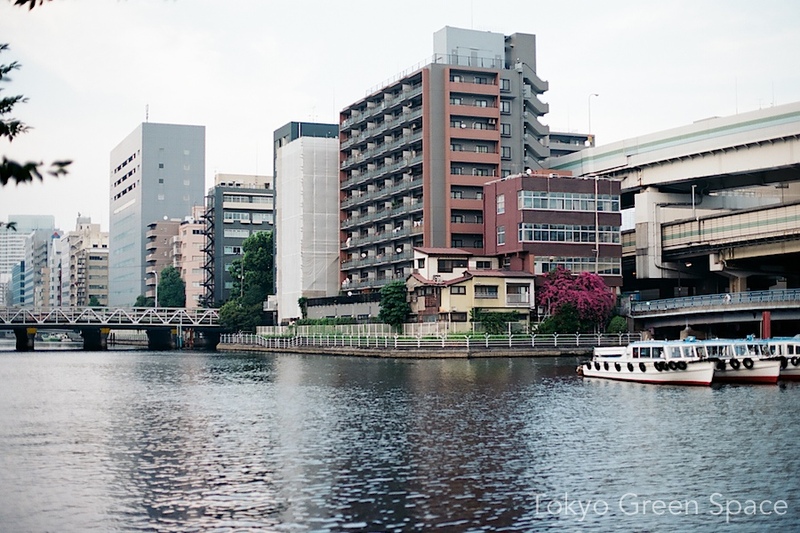 It’s just past Nonbei Yokocho and near the center of Shibuya. There was controversy over gentrification and corporate funding for city resources when the city accepted Nike sponsorship to renovate the park with design by Atelier Bow Wow. It seems the homeless merely migrated to the area just below the fenced-in skate park and fusball court. Now it is a typically Tokyo close juxtaposition of semi-public and vacant space, design and non-design, and living, sports, drinking, and parking spaces. 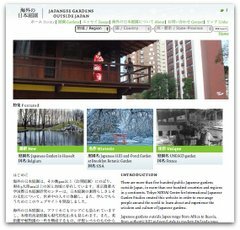 Chris has taken images from last month’s Tokyo DIY Gardening workshop at 3331 Arts Chiyoda, and created an amazing interactive map of Tokyo green space. Using photos, pens, markers, origami, and other stuff, 30 participants drew a giant collaborative map of Tokyo’s existing and imagined green spaces. In this interactive version, Chris shows off the final map, which was two by four meters, with detailed images of 46 spaces. Beyond our initial ideas, the collaborative map produced a huge variety of green spaces at many different scales, all of which make or could make Tokyo a livable city. We are planning to further document this mapping workshop, including other layers and voices, and we’d like to share it with a wide audience. Please feel free to link to it, leave comments, and share with others.